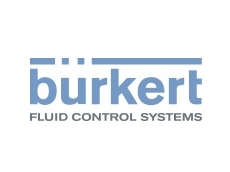 Bürkert has been a powerhouse in fluid control systems for 70 years. Their expanding global network, combined with ongoing optimisation of processes, allows them to exchange experience across borders and deliver solutions more effectively. In the Pacific region, Bürkert serves Australia & New Zealand by advancing Bürkert's German manufactured fluid control products, with local engineering know-how. The local teams include highly trained staff, which are on hand to answer technical needs; from one-off basic solenoid valves, to comprehensive networked systems. Strong competition for fieldbus systems is Industrial Ethernet. The strongest representatives here are Ethernet-IP, PROFINET, Modbus-TCP and EtherCAT. Compared to conventional fieldbus systems, Industrial Ethernet offers additional opportunities in large and highly automated factories:- Real-time data can be transmitted virtually simultaneously over a common medium.- Integration of almost unlimited number of nodes with equal rights is possible.- Large-area networks and efficient transmission of extensive data quantities can be realized.- Various transmission media can be combined.Bürkert’s broad MFC/MFM product range offers the adequate solution for all industry requirements: analogue and digital communication based on RS232 / RS485, as well as all standard fieldbus interfaces and industrial Ethernet standards. 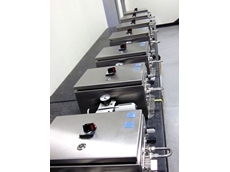 Mass Flow Controllers/Mass Flow Metres are compact devices that control the mass flow of gases. They control a pre-set flow rate reference value – regardless of disturbance variables such as pressure fluctuations or temporary occurring flow resistances, e. g. as a result of filter dirt. MFC/MFMs consist of the following components: flow sensor, electronics (with signal processing, regulation and valve control functions) and a solenoid control valve as an actuator. The reference value setting is made electrically via analogue signal or fieldbus. With its easy installation, the compact structure of the MFC/MFMs ensures the convenient operation of a complete (closed) control loop. The valve island Type 8652 AirLINE and the field device Type 8653 AirLINE Field provide easy commissioning and maintenance as well as minimised process risk – regardless of whether in the control cabinet or directly in the process environment. Thanks to a wide range of communication options they are also future-proof in times of Industry 4.0. In addition, the integration into the Bürkert platform EDIP is possible.Benefits for you: Integrated check valves: prevent unwanted valve switching Show number of switching cycles and predefined warning thresholds: Preventive and wear-optimized maintenance Redundant ring topology with Media Redundancy Protocol or Device Level Ring: Prevent total failure in case a single communication client fails LCD with alphanumeric display: fast information on device status Hot swap function: change valves during operation with no plant downtimeThe valve islands were designed for applications in the pharmaceutical, cosmetics, food and beverage industries as well as for water treatment applications. They offer users adjustable monitoring and diagnostic functions that improve system availability and process reliability, while at the same time enabling preventive maintenance.An integrated display for this purpose shows detailed on-site information such as the current switching statuses of the pilot and process valves, issues a message if pre-set pressure limit values are exceeded or displays errors such as cable breaks in plain text. Innovative Valve Automation - what is iValve? 24/06/14 - Burkert Fluid Control Systems offers a versatile range of automation and control technologies designed for processes of all sizes.Pneumatic process control systems are increasingly being adopted by various processing plants; however, the growing complexity of these control systems has resulted in factors such as reliability, integrity and correct specification becoming even more critical. Not every system requires large format valves, or fieldbus communication to achieve the required level of automation. In use for many years, especially in the pharmaceutical and food and beverage industries where hygienic conditions must be maintained, pneumatic control systems offer several advantages, including simplicity of design, low maintenance, and excellent reliability partly due to the use of compressed air as the power source. Being intrinsically safe, pneumatic systems can also be used in hazardous atmospheres.Modern control systems can be divided into two groups, centralised and decentralised. Centralised systems will have the main control functions grouped at a central point or located at the point of control, such as a process control valve. This system will usually involve a control panel containing a bank of control solenoids connected to the process control valves using air lines alone. In a decentralised system, the air supply is fed direct to the control valve and the integral control head uses control signals to determine the action required. The choice of system is dependent on the application since both have their advantages depending on the circumstances.Once the design scope is confirmed, it is important to ensure the proposed design will produce an effective and efficient control system that will be easy to maintain, expand, and clean to the required standard. The first step is to clean and regulate the compressed air supply to the control system using air preparation units that filter and regulate the air supply. These units remove water and oil aerosols while also controlling the system air pressure, all of which ensure correct operation of the system as well as reduced wear and corrosion of the components. Burkert offers standardised filter-regulator air preparation units, with and without isolation valve kits, for all manifold sizes. Air preparation units are available with a range of filter sizes, down to 0.01µm along with the option of an activated carbon filter that can remove oil aerosols to a level of less than 0.005 mg/m³. A range of connection sizes is also available in addition to explosive environment certification to comply with regulations when operating in hazardous atmospheres.Flow restrictors, one-way valves and check valves will all be needed as the system takes shape – all these components will need to be matched to the application with regard to construction material, sealing properties and connection sizes to ensure reliable and efficient service. For instance, the type TRG001, also from Burkert, contains a complete range of restrictor valves, check valves and flow control valves, with non-standard versions, materials and seals also available.All of this equipment will need to be connected together, requiring careful selection of threaded or push-in connectors or a combination of both. Again, the application determines the correct design of connector, especially the material choice, which could require FDA approval or the corrosion resistance of stainless steel. 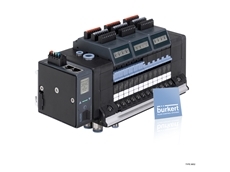 Burkert has developed a wide range of individual products for use in pneumatic process control systems as well as a process for designing, building, installing and commissioning complete systems. Burkert’s experience and expertise span a wide range of projects from the simplest closed loop control system to the largest factory wide production facility with the latest fieldbus communications and intelligent control valves. 24/04/14 - Fluid technology specialist Burkert supplied a fluid control system for the fuel cell stack of the hydrogen electric race car ‘Forze VI’ designed by students of the Delft University of Technology in the Netherlands.The hydrogen electric race car will attempt to break the record for fuel cell powered vehicles on the famous Nürburgring Nordschleife. 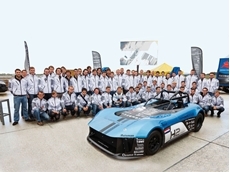 The car will also be competing against petrol powered race cars to demonstrate the performance potential of green technology.Different types of engines are used to power vehicles, with petrol, diesel, bio-fuels, natural gas, electricity and hydrogen being some of the choices available today. However, given the scarce fossil fuel resources, as well as cost and pollution factors, there is greater realisation of the importance of a sustainable solution for mobility. New, more sustainable systems have been developed over the recent years, including the hydrogen fuel cell car. Forze is considering hydrogen as one of the future solutions to power vehicles and other applications, even at home.Since 2007, Forze has developed five cars, all ground-breaking and successful in terms of both technology and performance. Beginning with providing component support including a proportional solenoid valve, a pressure sensor and a controller for the Forze IV, Bürkert inspired the Forze team to bring the solution to another level.Johann Gunnesch, engineer at the Systemhaus of Bürkert Fluid Control Systems in Ingelfingen develops custom highly specific system solutions for a wide range of applications requested by Bürkert customers throughout the world. The student team presented its flow plan for the fuel cell and explained the basic technical requirements.Describing the function of the so-called low pressure block, Johann Gunnesch says that the hydrogen coming from the tank first passes a shut-off valve. An integrated pressure relief valve has to release the hydrogen in the event of a malfunction. A Type 2875 solenoid control valve meters the hydrogen for the fuel cell by controlling the required pressure in the fuel cell. A Type 8701 flow meter measures the supplied quantity of hydrogen and sends this data to the vehicle’s electronic control system. The pressure and temperature are monitored constantly by sensors that send their readings to the controller to enable the fuel cell to operate under optimal conditions at all times. There is a Type 6011 bleed valve, which can evacuate the entire system in case the vehicle is not driven.The Forze VI represents a new era for the automotive racing world. With a car based on a Lotus 7 Type frame the chief engineer had the challenge to implement a 100 kW fuel cell and 190 kW boost power. The car also needed two 74-litre hydrogen tanks at 350 bar to feed the stacks together with a MassFlow meter up to 5,000 l/min air to provide enough oxygen.Bürkert integrated a newly developed laminar flow element to achieve the Forze VI requirements while maintaining the light weight and compact design but with at least four times as much capacity.Bürkert has designed the compact lightweight solution for Forze VI to achieve the fuel cell to power the 880kg car from 0 - 100 km/h in less than 4 seconds and reach over 210 km/h, leaving water as the only emission. 14/04/14 - Burkert Fluid Control Systems sheds some light on the correct selection of valves for use in any process control system.The type of valve, particularly the material used in its construction, is an important consideration for ensuring the performance and reliability of a process control system. 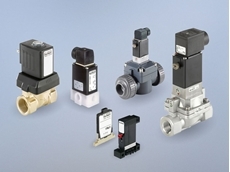 Bürkert examines the valve selection process, with a focus on the chemical resistance of various components.Valves are selected based on their end application. For instance, a valve in a brewery can be very different to the one used in a pharmaceutical application. One of the critical aspects of valve design is the chemical resistance properties of the valve housing and the gasket materials in relation to the substances it is expected to control. A long and trouble-free service can only be expected if the correct materials have been selected in the design process.Many of the components of a simple solenoid valve such as the plunger, return spring and seals are all exposed to the media. Therefore, information on the chemical compounds, temperature and pressure are necessary to make an informed material selection. If the production process involves liquid food products, the plastics and elastomers used should also conform to the local food and hygiene regulations. Some processes may require a cleaning cycle to be performed in-between production processes, which requires data that ensures no undue material degradation.Factors such as mechanical loading, increased temperatures and chemical concentrations all have a bearing on the performance of individual components, which can be manufactured from a range of materials. Valve bodies generally are made from brass or stainless steel with some from Polyamide.When selecting the type of valve most appropriate for any application, keep in mind that plunger-type direct acting valves are best suited to neutral and clean fluids while pivoted armature valves offer improved reliability by employing a media separating membrane to control corrosive, contaminated or aggressive fluids.Material choices are also available for sealing and separating membranes with each having benefits and drawbacks. Chemical compound, temperature, pressure and cost all combine to influence this design decision.Common compounds include:PTFE (Polytetrafluoroethylene) is almost totally insoluble and chemically inert with high temperature resistance. PTFE ball valve seats require no lubrication due to their natural lubricity. PTFE diaphragms and flange gaskets are used in extremely severe chemical resistance applications.EPDM (Ethylene Propylene Terpolymer), a synthetic rubber used as the standard seal material for many valves offers the most economical choice among elastomers and has excellent chemical resistance to acids, alkalis, salts and many others at temperatures up to 90°C. However, it is not suitable for use with oils, petrochemicals and concentrated acids.NBR (Nitrile rubber) offers high chemical resistance to oil and petroleum but is weak in oxidising media such as acids. Nitrile also has excellent abrasion resistance and is less expensive than FKM and FFKM.FKM (Fluorinated elastomer) and perfluoro-elastomers (FFKM) are more expensive than neoprene and nitrile elastomers because they provide additional temperature and chemical resistance. Certain grades of FFKM can perform continuously at temperatures above 200°C.PPS (Polyphenyl sulphide), a high performance thermoplastic used in many engineering applications performs above 200°C and offers resistance to acids and alkalis as well as abrasion, making it suitable for use as valve body material.PVDF (Polyvinylidene fluoride) is resistant to solvents, acids and bases, making it an ideal material for the valve body where high temperature resistance is not required. A very flexible product, it can be injected, moulded and welded, allowing easier manufacturing of the valve bodies.PEEK (Polyether ether ketone) has excellent mechanical and chemical properties but is susceptible to high concentrations of sulphuric and nitric acid. 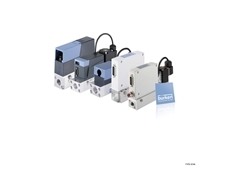 More expensive than other materials due to its improved performance, PEEK provides superior qualities for valve bodies.Burkert Fluid Control Systems offers a wide range of German engineered and manufactured solenoid valves, process valves, pneumatic actuation, instruments, microfluidics, mass flow controllers and accessories and accessories. 28/03/14 - Process control systems from Burkert Fluid Control Systems offer application versatility and feature a modular design to suit the growing needs of water treatment plants.Process control is vital to ensuring the integrity of the water supply chain in civil and industrial applications. 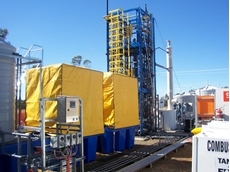 While process control equipment has consistently delivered improvements in design, installation and operation, it is important for the technology to stay abreast of the latest industry trends to ensure an efficient and effective system.Water is a finite resource and so the efficient management of this resource is a key driving factor behind industry investment. Much of the water used every day is constantly processed after use in a continuous cycle so that it can be returned to the environment before being extracted again, treated and reused. This process is heavily dependent upon precise process control, monitoring and data recording to ensure that all the regulatory standards are maintained while ensuring protection for the environment and the general population.The water treatment industry generally prefers to operate a centralised control system for each site, making it quicker and easier for operators to assess the equipment and processes on the site. 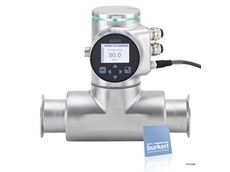 With such a wide array of sensors, valves and pumps installed around the site, the most efficient controller will be one that is capable of multiple tasks while still being simple to operate.Bürkert's type 8619 MultiCELL transmitter/controller, which utilises multiple sensors for pH, conductivity and flow, ORP and temperature measurements, is ideal for a wide range of applications in water treatment. Versatility is a major advantage of this controller as it is compatible with most common sensors and also has a modular design that allows additional hardware and software to be integrated easily.Each controller can be configured for a range of sensors as well as have up to six pre-configured I/O boards to accommodate any signal requirements. In addition, the MultiCELL can be configured as a data logger, using the built-in SD card slot for data storage. This SD card slot can also be used to save sensor parameters and control application settings to allow the same settings to be replicated in other MultiCELL controllers, ensuring the accurate transfer of control parameters between sites.The multifunction controller has been designed with both the installer and the operator in mind. The huge range of features and the modular design allow the system to be customised to the client’s exact requirements, while the easy, intuitive user interface can be configured in four different views to display the most relevant information to a particular application.Designing a system such as this essentially allows costs to be reduced in the processing applications; a systems engineer can, in many instances, replace an entire control cabinet with one neat controller that utilises a built-in display. The relative costs of a separate enclosure, rack mounted PLC, I/O, cabling, power supply, and HMI etc., can effectively be replaced with just one MultiCELL unit, cutting costs and streamlining installations.A key advantage of the modular expansion facility is that MultiCELL users only pay for the features that they actually require. Since the MultiCELL provides a single controller/transmitter across a wide range of applications, inventory and training costs are also minimised. In the long term, the total cost of ownership is greatly reduced when compared to the systems currently in use. 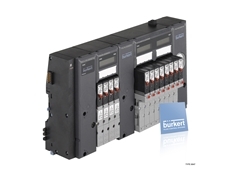 This unit is designed specifically to be panel mounted, either internally or on a door or bulkhead.Bürkert's mxCONTROL multifunction controller, type 8620 also has similar functions with additional benefits of Ethernet or modem communication as well as the ability to control digital dosing pumps. The flexible programming capabilities enable integrators and end users to make fast program modifications during commissioning and maintenance.An SD card slot is also provided for data logging and saving parameter settings to save time when installing many units across different sites. By using a simple user interface, easily configured control programs and common sensors, the whole process from design to implementation is streamlined for efficiency, reducing training time, parts inventory and overall cost of ownership.Both solutions allow direct connection to existing SCADA systems and other methods of site-wide monitoring and supervisory control, so adding connectivity to pH sensors and flow meters, for example can add to the automation efficiency of a plant, while supporting the case put forward by the panel builder or integrator for a smarter solution.New cloud-based monitoring solutions, such as Bürkert’s mySITE remote monitoring solution, can be added to any multichannel system to monitor sensor outputs. This supports email and text alarming, plus historical trending for process and maintenance optimisation.